The days are long past when a good percentage of the Church membership could fit comfortably into the Tabernacle, or when members routinely planned to take time off from farm work in the spring and fall to come to general conference. Although April and October general conferences have the comfort of planned regularity, that very comfort may obscure the dynamic nature of general conference. It is a vital, changing part of this ever-growing, and thus ever-changing Church. ﻿—April 1975: the first satellite transmission of conference. ﻿—October 1975: the reconstitution of the First Quorum of the Seventy and the last auxiliary conferences. ﻿—April 1976: two revelations canonized for the first time in this century. ﻿—October 1976: all of the Assistants to the Quorum of the Twelve became members of the First Quorum of the Seventy. ﻿—April 1977: the first two-day general conference, replacing the former three-day general conference. ﻿—April 1980: thirteen stake centers in the United States received satellite transmission of conference on their own receivers rather than picking it up through commercial channels that carried satellite broadcasting. This limited project was so successful that it was used again in the October 1980 conference. But despite changes involving the transmission of general conference to the Saints, there has (nearly) always been such a meeting, and it has always been vitally important. So important, in fact, that Elder Charles C. Rich of the Quorum of the Twelve snowshoed thirty miles until a team and buggy could take him the rest of the way. Elder Erastus Snow rode in a wagon three hundred miles to get to conference. Elder Ezra Taft Benson flew back from Washington, D.C., while he was Secretary of Agriculture. And Senator Reed Smoot came by train. For most of our 150-year history, Salt Lake City has been the place for general conference. But general conferences have also been held elsewhere: Fayette, New York; Kirtland, Ohio; Amherst, Ohio; Far West, Missouri; Quincy, Illinois; Nauvoo, Illinois; Council Bluffs, Iowa; and Logan, Provo, St. George, and Coalville, Utah. Only in rare circumstances is conference ever canceled or delayed. The October 1857 and the April 1858 conferences, for instance, were held while Utah Territory was under martial law and a hostile army camped at Fort Supply. The only general conference in the twentieth century to be canceled completely was in October 1957, because of the Asian flu epidemic that was sweeping the country. Influenza also postponed the April 1919 conference till June. That conference, in solemn assembly, sustained Heber J. Grant as President of the Church. Generally, only General Authorities now address conferences, but a list of speakers from the past includes not only all of the General Authorities, but stake presidents, mission presidents, representatives of the president of the United States and the Boy Scouts of America, and even the chief of staff of the United States Army. The first general conference was held in Fayette, New York on 9 June 1830, two months after the Church’s organization. Only seven elders were present; the entire Church had fewer than a dozen priesthood holders. Joseph Smith read the articles and covenants (D&C 20) which were received by the unanimous voice of the whole congregation. Oliver Cowdery ordained Samuel Smith an elder; then Joseph Smith, Sr., and Hyrum Smith were ordained priests. Thus began the general conference heritage of the Church. Those early conferences were more like church business meetings. Men were proposed for and sustained in the priesthood. Members of the Church made suggestions and presented resolutions from the floor. Church members were tried, disfellowshipped, excommunicated, chastised, praised, and reinstated. At first, conferences were convened at the First Presidency’s request at different times of the year and in different places. The 6 April 1833 general conference was held at the ferry on the Big Blue River in Jackson County, Missouri. It was not until Church headquarters moved to Illinois that the pattern was set of holding conferences in each April and October. In 1850 the President of the Church was first sustained as “prophet, seer, and revelator.” The name of the patriarch to the Church was first presented for sustaining with the other General Authorities at the 6 April 1843 general conference. The April 1844 conference was distinctive for three reasons: conferences became a time of instruction rather than business, Joseph Smith was nominated as a candidate for the United States presidency, and it was the last conference over which he presided. Newell K. Whitney was sustained “first bishop” of the Church at the October 1844 conference, and as presiding bishop at the 6 April 1847 general conference﻿—the first time a presiding bishop had been sustained with the other General Authorities. Because of unsettled conditions no general conference was held in 1846; but a very important one was held in December of 1847, at which Brigham Young was sustained as President of the Church with Heber C. Kimball and Willard Richards as counselors. After the Saints’ arrival in the Salt Lake Valley, general conference became a time of reunion and spiritual growth. Mission calls often came from the pulpit with no prior warning. Brigham Young or Heber C. Kimball’s voice would boom, “Hosea Stout, called to open the Chinese Mission; Andrew Shumway assigned to the British Mission; Orson Pratt to England.” Others were sent to colonize the more than 350 places settled under Brigham Young’s direction: “Erastus Snow, Southern Utah; Isaac Morley, Sanpete; Orson Hyde, Carson Valley; Charles C. Rich, San Bernardino.” Such calls added to the excitement of attending a general conference. During those first few years in the Salt Lake valley, fall conference was often held in August or September so that the newly called missionaries could leave before winter storms closed the mountain passes. 4. 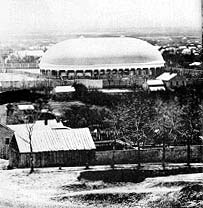 In this photograph taken around 1864, the old tabernacle (built where the Assembly Hall now stands) is on the left, and the Bowry is on the right. For most Latter-day Saints, the Tabernacle and general conference seem synonymous. Although the Tabernacle was not dedicated until 1875, it was first used in the October 1867 conference. There were only 100,000 members of the Church residing in four stakes and ten missions at the time. Eliza R. Snow composed a special hymn for the occasion, Joseph J. Daynes played the not yet fully completed tabernacle organ, and the music for the conference was furnished by the combined Springville and Spanish Fork choirs. This conference was also somewhat unique: it lasted four days because the congregation voted to stay for an extra day. 3. 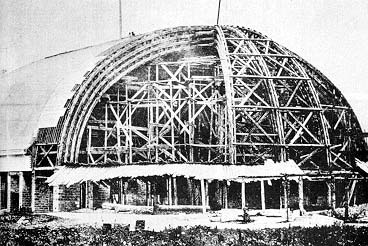 The Tabernacle under construction in 1866. Note the extensive scaffold system. In October 1880, Elder George Q. Cannon, then First Counselor to the First Presidency, held up the Doctrine and Covenants and the Pearl of Great Price before the members and explained that new material had been added since the original canonization of the Doctrine and Covenants in Kirtland. The brethren felt it wise, he continued, “to see whether the conference will vote to accept these books and their contents as from God, and binding upon us as a people and as a Church.” Thus the Articles of Faith became binding scripture upon the Latter-day Saints when the Saints voted to accept them at the October 1880 conference. Other conferences held during the 1880s were influenced by government harrassment. Because leading brethren of the Church were forced into hiding “on the underground,” general conference was held in Logan in 1885; in Provo, April 1886; Coalville, October 1886; and back in Provo, April 1887. It was not until October of 1887 that conferences were again held In Salt Lake City. At least one session of the April 1893 conference was held in the upper room of the Salt Lake Temple when President Wilford Woodruff dedicated it. A year earlier, part of the conference had been the capstone ceremony. Church members in the April conference of 1896 voted on a “Political Manifesto” which proclaims that leading Church officials must have approval of the First Presidency to run for political office. The auxiliary boards of the Church were first sustained In the 1898 general conference of the Church, and the revised edition of the Pearl of Great Price was canonized in the October 1902 conference. Voting to donate two hundred tons of flour for the relief of famine-stricken Chinese was a part of the 1907 conference. In October 1908, those assembled first heard a report from an auditing committee stating that Church financial matters were conducted along acceptable and authorized procedures. General conference in 1919 included a talk by President Heber J. Grant in support of the League of Nations. He declared that the scriptures were not adverse to the League and that he had, with ex-President Howard Taft, President Lowell of Harvard University, and other prominent United States figures, signed a manifesto in support of the League. Speakers at general conference had to rely on the acoustics of the Tabernacle and the power of their voices until the April 1924 conference, when the microphone was first used. Sound was also piped to the front of the Bureau of Information so that people unable to get into the building could listen to the proceedings. In the October conference that same year, general conference was first carried over KSL Radio, and the addition of a control room in 1938 enabled other stations to pick up the sessions as well. The First Presidency made two important declarations in 1936: first, a statement against communism, and second, a “Church Security Program,”﻿—now known as the welfare plan﻿—to help alleviate the suffering of the poor. President Heber J. Grant himself presented the motion to the conference for ratification. The concern of the Church for its members serving in the armed forces was a touching part of the October 1942 conference sessions. President David O. McKay, then Second Counselor in the First Presidency, declared that the Church would ever be against war, which has its roots in evil. Nevertheless, war had come; and young men the world over were duty-bound to respond to the call of their respective countries. President McKay counseled those called into military service to serve honorably, without hate or malice, and be true to the oath and covenant of the priesthood and their oath of chastity. Another moving part of this fall conference was a special session in which the sacrament was passed to the assembled Saints, under the, direction of President of the Quorum of the Twelve, Rudger Clawson. The rest of the session was devoted to testimony bearing. Those present testified that the Spirit of the Lord was present and the Saints returned home better able to cope with the dark days ahead. Assistants to the Quorum of the Twelve were sustained in the 6 April 1941 session of general conference; Elder Marion G. Romney was the first name presented. In 1949, television came to conference, somewhat changing the format. General Authorities began giving sermons occasionally that might appeal to nonmembers listening to the proceedings. In addition, time limits were imposed on the talks to allow for station breaks that would not interrupt the speakers. In the 1962 conference, sermons were first translated into foreign languages, and a translation room became a part of the Tabernacle. The 1967 general conference was broadcast in living color for the first, but certainly not the last time; and a number of Regional Representatives of the Twelve were sustained in the October conference. Also at the 1967 conference Alvin R. Dyer was sustained as an Apostle, though he did not become a member of the Quorum of the Twelve. This had last been done in 1938 when Sylvester Q. Cannon was sustained as an Apostle; however, he later became a member of the Quorum of the Twelve. In the past decade, the technological innovations and history-making events of the 1970s are, certainly, only a prelude to the exciting events of the 1980s. Each Latter-day Saint has his own special memories of conference. He may visualize Saints sacrificing to come, then responding to inspired messages. He may remember the sure and steady counsel of President Joseph F. Smith; think again of the dynamic enthusiasm of President Heber J. Grant; or recall President George Albert Smith’s marvelous sermons on moral purity and love. He may see President McKay in his advanced age supported at the podium by his two counselors while the choir and congregation sing “The Spirit of God like a fire is burning”; he may think of President Joseph Fielding Smith pleading with the members to be faithful; of President Harold B. Lee moving the Saints to tears as he talks with humility about assuming the mantle of the prophet; or of President Spencer W. Kimball declaring with no uncertain sound the way the Saints of God should live. 2. The Tabernacle around 1870. Whether in the Tabernacle, in their own living rooms, or from reading the messages later, members feel the spirit of faith and testimony that moves outward to touch their lives from this moment of instruction, this time of strengthening called general conference. Kenneth W. Godfrey, director of the Utah North Area, Church Educational System, is a high councilor in the Logan Utah East Stake. 1. A July 24 celebration in the 1890s, with President Wilford Woodruff and other General Authorities sitting on the stand. 5. April 6, 1892﻿—laying the capstone of the Salt Lake Temple. 6. Temple Square in the late 1890s. Hotel Utah was later constructed on the site of the Deseret News Publishing Company building. 7. This photograph﻿—which was probably taken around 1905﻿—shows pedestrians and workers near the outside wall of Temple Square on South Temple Street. 8. Children posing in front of the Tabernacle in the 1890s. 9. A group of conference visitors in front of the Assembly Hall in the 1930s. Radio Broadcasts of conference began in 1924. 10. A photograph taken from inside Temple Square around 1910. 11. An interesting photograph of Temple Square taken around 1930. The Brigham Young monument is visible in the foreground. 12. The scene between sessions of conference﻿—around 1950. 13. President David O. McKay speaking at the October 1954 Conference. President J. Reuben Clark, Jr., is just behind President McKay. Elders Mark E. Petersen, Henry D. Moyle, Delbert L. Stapley, LeGrand Richards, Richard L. Evans, and George Q. Morris are in the first row below President McKay, and Elders Oscar W. Kirkham, Sterling W. Sill, Hugh B. Brown, John S. Longdon, Alma Sonne, and Clifford E. Young are seated in the second row. 14. April 1949﻿—the first television coverage of conference. 15. Visitors at a 1950s general conference. 16. On 6 April, 1980﻿—the 150th anniversary of the organization of the Church﻿—Elder Gordon B. Hinckley read a special proclamation from the Peter Whitmer farmhouse in Fayette, New York. Looking on are Elder Hugh W. Pinnock and President Spencer W. Kimball.